Late 1800s, elm, Shanxi Province. Classical in its simplicity of design; easy to fit in at a dining table or beside a side table. This kind of Chinese yoke-back side chair has been given the name “Official hat chair” because with the top horizontal rail protruding over the back posts, the back rail resembles the winged hat which was part of the formal dress of Ming officials. It is said to be the oldest of vertical chairs in China, and depicted as the stately seat of Buddhists, deities, royalty, and important people. With its high back, it forces the occupant to sit more on the edge than leaning back, forcing him to sit up tall in a dignified and commanding posture. 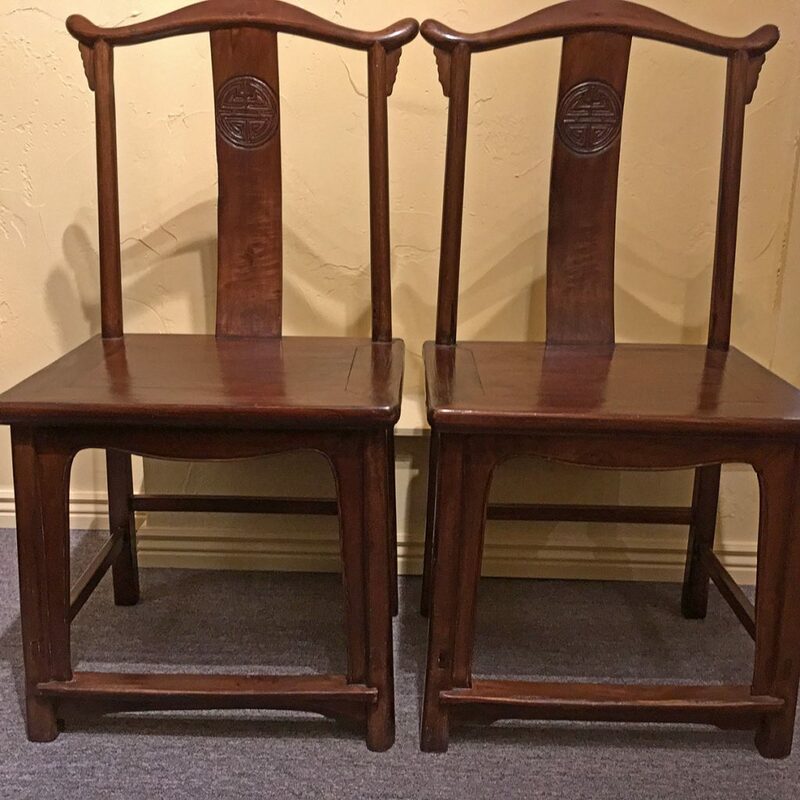 This pair of chairs show traditional mortise-and-tenon construction. Each one has a backward curving yoke with tear-drop (rounded) ends, tall vertical back posts, and a recessed curved back slat. A relief carving of stylized “Shou” (long life) is on the front of the back slat. Small plain spandrels are beneath the yoke. The hard wood seat is constructed with a floating panel. A cross bar underneath strengthens the seat. Below the seat a recessed arched apron with beading extends along the front and roundly goes down the inner leg posts as spandrels, ending on top of the foot rest. The aprons on the sides, back, and beneath the foot stretchers are straight, with short curved spandrel ends. Stepped stretchers are between the legs. This “stepped” construction is supposed to prevent over-lapping the mortise and tenon, so strengthening the legs.